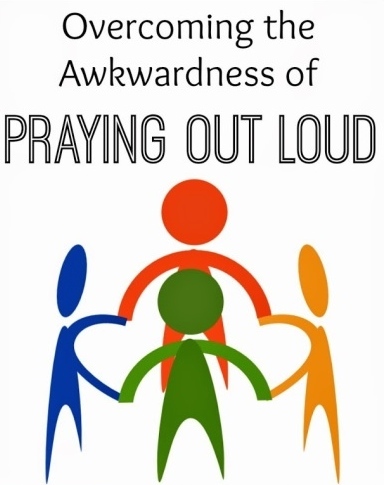 When I mentioned my discomfort with audible prayers last week, I had no idea it was such a common fear – probably because I’m surrounded by so many eloquent and faith-filled supplicants. Determined to overcome my prayer panic, I searched for advice online. I discovered a plethora of support and suggestions for victims of this particular malady. In fact, I felt like I stumbled into an online, 12-step program for prayer paralytics. I read testimonials mirroring my own visceral responses of terror including a pounding heart, sweaty palms (particularly embarrassing if you’re holding hands), stammering, verbal paralysis and/or a resounding mental voice screaming “RUN!” I was astonished to discover that many of these confessions came from PASTORS and others in ministry! I was in good company. Like any reputable recovery program, I was directed to a bevy of tips to assist me in conquering my prayer-induced anxiety. Amidst the myriad of counsel and guidance, simplicity and brevity were strongly encouraged. As one website warned, “don’t let your mouth keep moving after your heart has been heard.” Funny, Matthew had a similar suggestion in his gospel. “When you pray, do not keep on babbling like pagans, for they think they will be heard because of their many words.” He then goes on to say something that I found most reassuring, “Your Father knows what you need before you ask Him.” That truth certainly takes the pressure off. If you struggle for words, another direction was to pray Jesus’ own words back to Him, clinging to the thousands of promises He makes. He’s given us a book of them for every occasion. Thankfully, paraphrasing is acceptable as my memory is not what it used to be. There’s even a specific promise to hold on to for prayer paralysis in Romans 8:26, “God’s Spirit is right alongside helping us along. If we don’t know how or what to pray, it doesn’t matter. He does our praying in and for us, making prayer out of our wordless sighs, our aching groans.” (MSG) That’s the promise I’ve chosen to keep in my arsenal for the next time timidity strikes. Finally, I discovered that if all else fails, there’s nothing wrong with “Dear Lord, exactly what she said. Amen.” This may be an oversimplification, but choosing to affirm or take cues from another’s prayers is perfectly legit. There’s no punishment for plagiarizing prayers. The expression ‘God is more interested in our character than our comfort’ certainly applies in this matter. I’ve been praying for guidance as to how to get off the spiritual plateau I’m on. ‘Through prayer’ is obviously His answer, which is why He keeps putting me in situations where I am challenged to step out of my comfort zone. My own tidbit of advice to fellow sufferers of praying-out-loud-in-a-group nerves would be to choose to follow Peter’s instruction to ‘cast all your anxiety on Jesus because he cares for you.’ I choose to dump all my other ‘issues’ in His lap, so why not this one?